The cells of eukaryotic organisms, such as humans, maintain their genetic information in chromosomes composed of deoxyribonucleic acid, or DNA, residing within a cell nucleus. 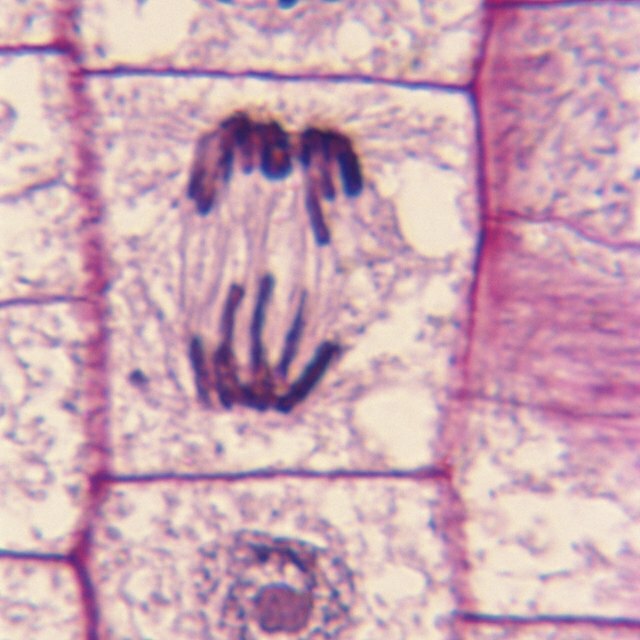 Cells undergo alternating periods of growth and division. During the growth phase, or interphase, the cell replicates its DNA. The next event in the cell cycle is mitosis, or nuclear division, followed by cytokinesis, or cell division. Prokaryotic cells such as bacteria follow a simpler process of cell fission. DNA and certain proteins known as histones form the chromosomal structures. The DNA is double-stranded and forms a tightly coiled package with the assistance of the histones. During interphase, the chromosomes relax, giving replication enzymes access to create a new copy of each chromosome. The twin copies, or chromatids, are joined by a globular protein structure called the centromere, forming the familiar X shape of chromosomes. The condensing of the double-chromatid chromosomes marks the end of interphase and the start of mitosis. The first stage of mitosis is prophase, in which the nuclear membrane disintegrates. During prophase, the cell creates microtubules attached to two organelles called centrosomes, which migrate to either side of the cell. As prophase progresses into metaphase, the microtubules approach the chromosomes. A kinetochore consisting of protein sprouts from each chromatid, forming a structure to which the microtubules can attach. The chromosomes align on the metaphase plate in the center of the cell. Humans have 23 pairs of chromosomes, one pair member from each parent. At the end of metaphase, each chromatid is attached to a microtubule anchored by a centrosome. The next stage, anaphase, begins when the centromeres dissolve, converting the sister chromatids into daughter chromosomes. The human cell temporarily has 92 chromosomes at this stage rather than the normal 46. The centrosomes pull the microtubules with the chromosomes in tow to either side of the cell, so that both sides have a complete set of genetic material. In telophase, nuclear membranes reappear, enclosing each set of chromosomes. The chromosomes then begin to relax from their tightly coiled state. As mitosis ends, the cell begins to divide down its center. 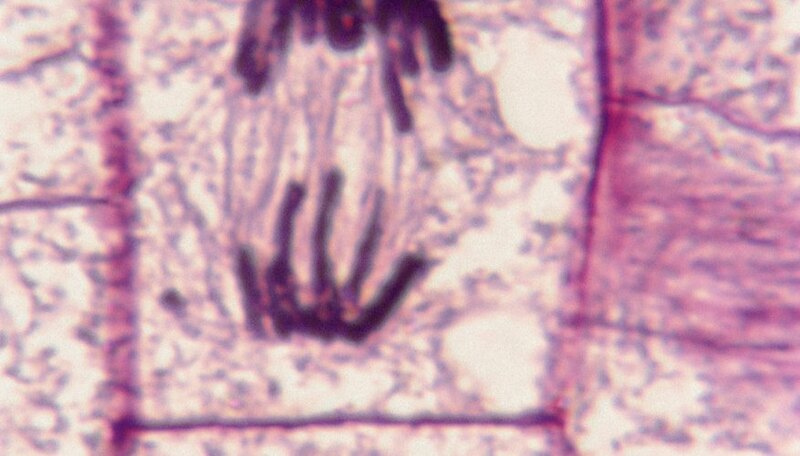 A contractile ring at the site of the old metaphase plate pinches the cell, creating a furrow that deepens as the cell synthesizes new outer membrane material. The nuclei are separated by the new cell membranes. Eventually, the cell divides into two daughter cells, each containing the full complement of chromosomes. The two cells then enter interphase and the cell cycle repeats. Bank,, Eric. "Which Event Will Follow DNA Replication in a Cell Cycle?" Sciencing, https://sciencing.com/event-follow-dna-replication-cell-cycle-23039.html. 25 April 2017.